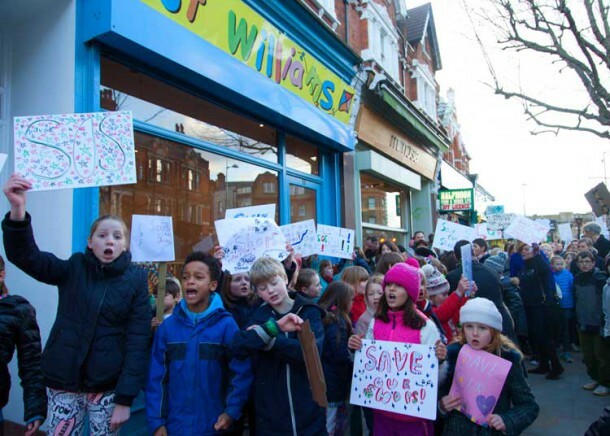 More than 300 children, parents, traders and cuddly toys protested at the weekend against “astronomical” rent rises from a charity landlord that has forced the Just Williams toyshop in Herne Hill to close. They marched from Herne Hill station to the toy shop in Half Moon Lane, chanting “Save our shops. Save Herne Hill” while holding toys and banners reading “Dulwich Estate Toy Snatchers”. 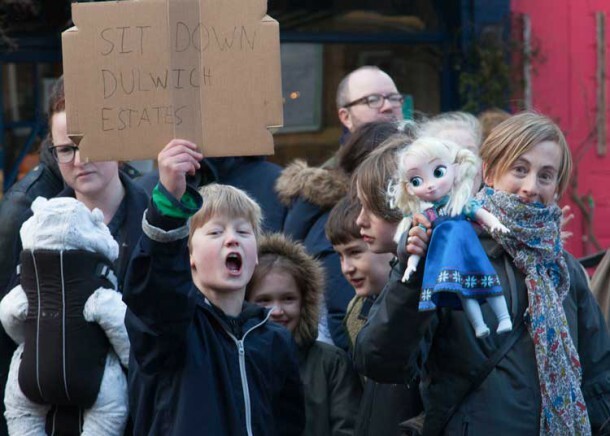 Traders say that The Dulwich Estate, a charity that funds some of London’s top private schools, has threatened the survival of independent shops by pushing up rents by as much as 70% since they were last set five years ago. The estate owns the freehold of another local favourite, the Half Moon, whose supporters are campaigning hard to save it as a music venue when it reopens, rather than just another posh pub. The charity earns roughly £6 million a year from its portfolio, has net assets worth more than £262.5 million and counts fee-charging schools Dulwich College, Alleyn’s and James Allen’s Girls’ among its beneficiaries. 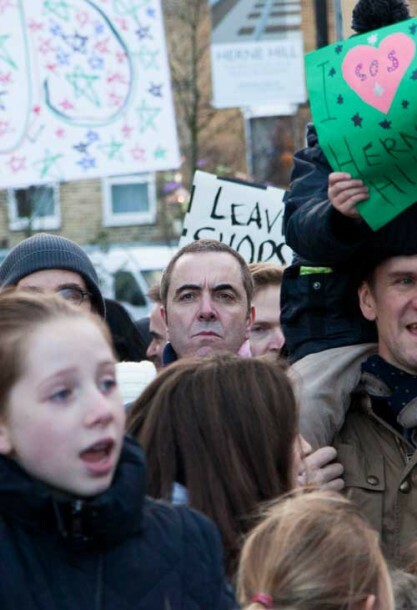 A petition calling for it to charge “reasonable” rents has gained thousands of signatures, as well as backing from celebrities including Lucky Man actor James Nesbitt, who is a local resident. “The fact that Dulwich Estate, a wealthy landowner, is hiking up rates, which only benefits fee-paying schools, while depriving the community of all these individual shops, is beyond me. It just seems crazy that Dulwich Estates wants to do this to its own community, ” Nesbitt said from the march on Saturday afternoon. Karina, co-owner of bike shop Bon Velo, voiced the widespread concern among traders that such steep hikes would set a precedent for private landlords in the area. She cited her own upcoming rent review and said she faced an 80% increase. Giles Gibson, chairman of the Herne Hill Forum, which organised the protest, said: “Just Williams, our only local children’s toy shop in Half Moon Lane, has gone. They could not afford the near 70% rent hike that local landlord Dulwich Estates imposed. “It’s just not fair,” Isaac added. Their assets grew from £235.9m to £262.5m, according to the accounts. I make that an 11% increase in value which, when added to the 2.3% income return, places them squarely in the middle of Jerry’s “commercial” property companies’ desired returns. If, as you report, the charity is getting £6m in income from property worth £265 million, then that is only 2.3% return. Add in 4% increase in value and you still have only 6.3%. Commercial property companies look for 12 to 15%. The trustees of a charity have a duty to do their best for the beneficiaries. They seem to be acting reasonably to me. But then I’m just a dessicated calculating machine. But at least I live on Planet Earth.